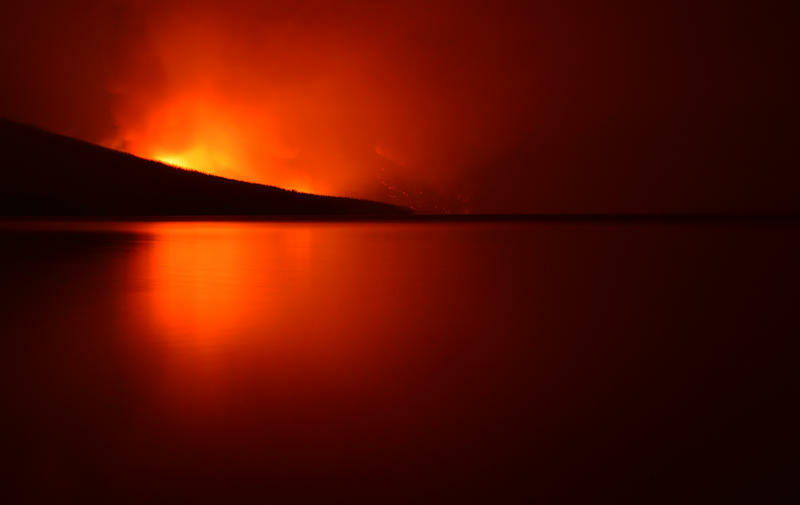 The Howe Ridge Fire seen from across Lake McDonald on the night of August 12th, roughly 24 hours after the fire was started by a lightning strike in an area previously burned in the 2003 Roberts Fire. 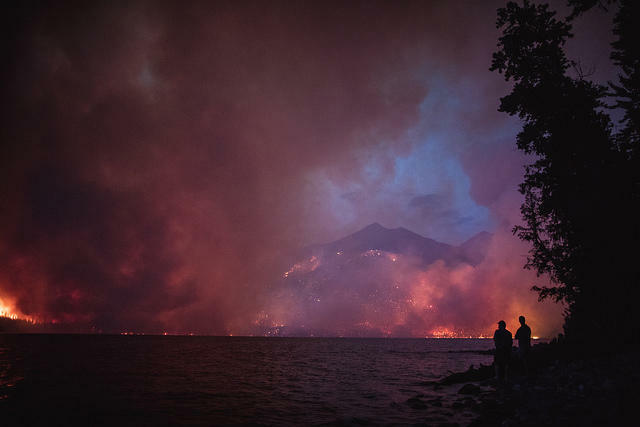 He and other Park officials answered questions Monday night for about 70 people who had been evacuated from the northeast tip of Lake McDonald. On Tuesday morning, the Park confirmed that seven private summer residences and additional outbuildings were lost at Kelly’s Camp, as well as the main camp house, a second cabin and other structures owned by the National Park Service. Additionally, three outbuildings at the Wheeler residence, also owned by the Park Service, burned, along with the Wheeler boat house and the boat house at the Lake McDonald Ranger Station. The main Wheeler cabin survived, thanks to what the Service describes as “valiant firefighting efforts that saved it after it caught fire.” The Lake McDonald Ranger Station was also saved after its roof caught fire. Paul Austin is Glacier’s chief ranger. He walked the room through those past 48 hours, starting with the lightning storm Saturday that ignited nearly two dozen spot fires across northwest Montana. "Expecting and knowing that every fire we have right now is get-on-it-immediately. Get orders in and do everything we can to nip it and squash it," Austin said, "so we did." Austin says a 12-person hand crew was dispatched for initial attack Saturday evening but they couldn’t safely access the blaze from the ground. "Howe Ridge is brutal," he told the homewoners. "It's in that 2003 Robert's Fire, and just really hard to get through." On Sunday morning they sent super scooper air tankers to douse it, and for a while it looked like they had a handle on it. Then the winds kicked up Sunday evening. "It's all hands on deck," Austin said of the response. Many homeowners had been through close calls before and evacuated without prompting. Others told Park officials they never got a knock or a call to evacuate. Shortly after everyone was out, several of the twelve cabins at Kelly’s Camp, some of them listed on the National Register of Historic Places, at the very end of the road ignited, one by one. "What we were seeing from the ground was, oh we're going to be fine," said Regine McGee, "But no, when you drove to the other side of the lake and looked back, it was like, oh, oh, ohhh, that's not good." McGee has spent more than a dozen summers at Cabin 2 at Kelly’s Camp. It was one of the originals, the notched log walls still cloaked in bark, the lake-facing porch still holding down the same footprint it did when Steve Kelly built it as part of a set of rentals in the 1920s. McGee says when she left it, her neighbors materialized out of the thick smoke, intent on wrapping their cabin. She offered them a ride out to the Lake McDonald Lodge, but they said they had getaway canoes. When she got out of the evacuated zone to the Lodge, she says, "nothing was happening on this side of the world. everything was normal. then I look over there and I think, that's not normal. It was such a dichotomy of how calm and obtuse everybody on this side seemed to be. They got to be carrying on their own day and their own thing, no rush, no stress. And I think, my people are over there fighting for their life to save this legacy and history and these stories and these memories and these logs, and everything associated with them. It was so surreal." McGee is already thinking of next season as a fresh slate. She wants her son to rebuild the cabin and for his generation to make Kelly’s Camp anew. But she also says she feels for her neighbors, who grew up here, learned to swim here, fell in love here. She says the cabins may be gone, but Kelly’s Camp will live on. "That's what it means," McGee said "It means family, wisdom. it means stories, it means fascination, it means fantasy. it means bears. it means things you won't get anywhere else. You won’t get them anywhere else." People at the meeting praised the firefighters but criticized the park for not quashing the fire sooner, not giving enough warning before the evacuation and not shepherding tourists away from their communal tragedy. Chief Ranger Paul Austin nodded as he listened. "If I could do it again, I clearly would," he said. Superintendent Jeff Mow reminded everyone it’s still early August. This time last year, firefighters were engaged in initial attack on the Sprague Fire. "I think it's important to keep note that the Howe Fire is not over yet," Mow said. Editor's note. This post was updated at 11:50 a.m. 08/14/18 to report the number structures lost in the Howe Ridge Fire.